Gorgeous semi-precious gemstones, freshwater pearls and ocean shell are highlighted features in these variously-styled bracelets. These bracelets can include high-quality crystals or Swarovski crystals, German Silver beads and non-tarnish chain. 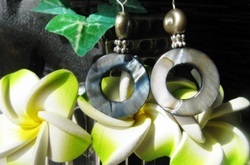 These elegant earrings are only a sample of what I sell. And the prices are amazing.